September | 2016 | US Registries LLC. If the data say no, can the Fed really go? WHAT IT MEANS: If you have missed my economic missives, it was because of the dearth of information. Well, today, the economic data mills released a ton of numbers and they all seemed to say the same thing: Not much is happening in the economy. August retail sales were pretty soft, but we knew that would be the case from the decline in vehicle sales. However, even excluding vehicles, sales were down. People did eat a lot, both at home and in restaurants, and back-to-school clothing sales were good. But that was about it, as almost every other major category was either flat or down. Electronics and appliances did eke out a small gain. With households not buying, manufacturers stopped producing. Industrial production fell in August as manufacturing output declined. Eight of the eleven durable goods producing industries and seven of the nine nondurable components were either flat or down. Why there was such a major retrenchment is strange in that the numbers looked like something we would get when the economy was in a major downturn. You know something is weird when the strongest sector was oil and gas production. If the Fed members were hoping to see inflation pressures starting to build, their wishes were not granted. The inflation genie is still in the bottle as the Producer Price Index was flat in August. Energy prices fell sharply, but even excluding energy, wholesale costs went nowhere. About the only positive aspect of this report, at least for the Fed, was that goods inflation has finally flatlined. With services costs rising, wholesale prices could increase, year-over-year, going forward. And as far as the pipeline is concerned, intermediate level, non-food and energy costs are firming. That hints at slowly rising inflation as well. The one truly positive number released today was unemployment claims. They rose minimally and the level remains near record lows, when adjusted for the labor force. The labor market is tight and firms are just not cutting staff. MARKETS AND FED POLICY IMPLICATIONS: We will find out next week if the Fed is really data dependent as the recent numbers hardly argue for a rate hike. Vacations and a hot August may have depressed activity, something we will not know until the September numbers are released. Of course, those reports will not be released until after the meeting. The economy is moving forward at the pace we have seen for the past few years. The string of roughly 1% growth rates should be broken this quarter, but that would just start bringing us back to 2%, which most economists think is underlying the growth rate. The recent disappointing data places the Fed in a difficult position. If the FOMC raises rates, then it would give lie to the argument that the Fed is data dependent. If the Fed is data dependent, then the next time a hike would likely come is December, since the November meeting ends six days before the election. It looks like the Fed will have missed another opportunity to start the normalization process because the “data dependent” argument has placed the members in an untenable position. Maybe they should just drop the phrase. 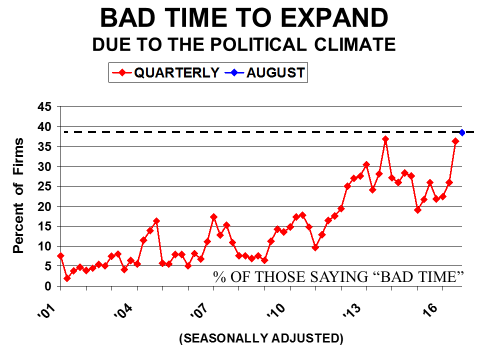 It’s dumb, as the data are so volatile, and weak numbers box in the members. With strong data, the Fed doesn’t need an explanation, as the markets will be expecting, if not demanding a move. The world is crossing borders at record speeds. International tourism receipts are increasing, on the back of a strongly growing global middle class and a steady rise in visa-free travel: above average growth for six years straight; and for the fourth year in a row, global tourism spend has grown much faster than merchandise trade. The rise of China is dominant here, with 120 million Chinese now traveling abroad every year; a trend showing no sign of slowing (interestingly, around the world, only tourism from the former Eastern bloc is significantly shrinking). It’s also developed world interest in ever-more global destinations: even North Korea’s repeated arrests of visitors has not deterred westerners from reaching as far as the hermit kingdom. The same trend holds for international students. 2015 saw nearly 1,000,000 international students coming to the United States (by far the most important destination for higher education); a 10% year-on-year increase, and the fastest rate of growth since 1979. The rise of China again drives the trend; making up 31% of the total foreign student count (India has 14%, Korea 7%, and Saudi Arabia 6%). FED OFFICIALS CALL FOR MORE “INFRASTRUCTURE” INVESTMENT? Talk at Aspen was cheap as it always is, with government officials, past and present, calling for more PUBLIC investment in infrastructure, education, training and the like and everyone looking for clues about the direction of monetary policy. The Fed has become the dominant factor driving financial markets, “follow the Fed”. So, PUBLIC investment is the key to raising productivity and stimulating the economy? The last attempt to do this with “shovel ready projects” (which didn’t exist) misfired badly. “Roads and bridges”, yes, there is a great need to invest, some of this is federal (highways) but most of it is in the province of state and local governments whose resources have been drained by slow growth, lower tax revenues, increased welfare payments, unemployment benefits, pension shortfalls, rising public employee costs, and flight from efforts to tax consumers and private businesses to make up the deficiencies. As a stimulus, this is a poor choice. Planning and permitting lags are long, and this is a capital intensive business, requiring massive amounts of heavy equipment, not of workers. Environmental regulations pose major barriers to progress in these area. We tried this before and it didn’t work. “Education and training”, yes, education needs to keep pace with a fast changing job requirements. However, this is not well done by managing education from a large office building in Washington D.C. Innovation is stifled by local politicians and teachers unions and certainly isn’t taught or encouraged in public schools. Educational costs go up but results do not. Short on revenues, governments at all levels are relying on debt to pay for what little they do. This will only have an unhappy ending as many of our cities have already discovered. Federal spending increases would also be funded by debt because the federal government always runs a deficit, so more spending means more debt (unless taxes are raised). In the late 1990s, surpluses were run and debt paid down under the control of a Republican Congress and a strong economy (which the Fed cannot produce). The real source of productivity gains is the private sector, driven by private innovation and investment in real capital assets (snowplows vs shovels to move snow). This is not the province of Washington D.C. What Washington D.C. does do is tax away the earnings that private firms use to finance growth, and impose “redistributive” regulations on firms that waste private resources (including time) and lower the prospective return on investments. Compliance costs in financial and educational institutions for example impose large demonstrable costs but real benefits for consumers are less clear. “PC” has become expensive, colleges and universities have very expensive offices devoted daily to these issues, but benefits are less than clear. Meanwhile, tuition rises. Hiring a worker has become increasingly expensive, paperwork, compliance, taxes, the minimum wage, mandatory health insurance, sick leave and family leave, legal liability, complexity in wage and salary administration, FLRB rulings on unionization etc. Employers are motivated to find a way to hire fewer workers by the government or prevented from hiring workers by the minimum wage. Interest rates are historically low and large firms have billions in cash stashed away. Why won’t they spend it, particularly on new equipment and expansion? Investment in plant and equipment is all about the future, including the decision to “replace” worn out capacity. It is obvious, then, that business’ view of the future is not particularly positive. Cash has been used to repay debt, buy back shares, pay dividends, and acquire existing firms, but not much investment in new assets. The process is simple, expected profits or cash flow from an investment are calculated and discounted by an appropriate discount rate which incorporates market interest rates and a risk premium related to the probability that the project will successfully produce the expected returns. Any stream of expected returns will look better if interest rates are lower. When market interest rates are so low, it is the risk premium that dominates. The higher the Discount rate, the lower the estimated value of the investment. Discount Rate = Real rate of interest + Expected inflation + Risk premium. The Risk premium (will the bond be repaid?) that financial markets place on a bond issued by a particular company for a certain maturity can be calculated from information about the price of the bond and the terms it offers using current market rates. For equities this is not the case, but implicitly the purchaser of stock makes this computation for expected profits. For greenfield investments (plant and equipment) the choice of the Risk premium is even more subjective. It depends on the expected course of the economy, regulations specific to the investment, the economic performance of customers, tax policy and the Fed. 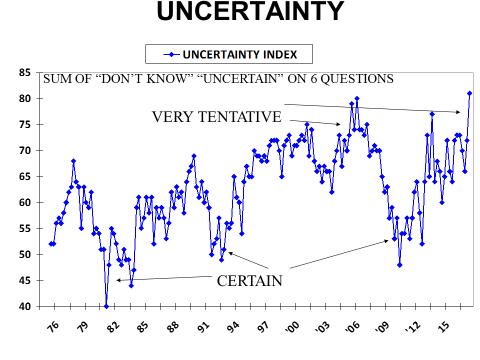 All uncertain. The Fed has driven rates on risk free assets to near zero levels, inflation rates are below 2% and consumers expect them to stay low for a long time (University of Michigan). This leaves the Risk premium which must be very large to discourage investment with such low capital costs. 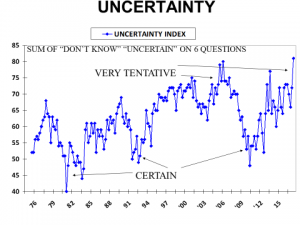 Uncertainty, measured by the National Federation of Independent Business, is at its highest level in 40 years. 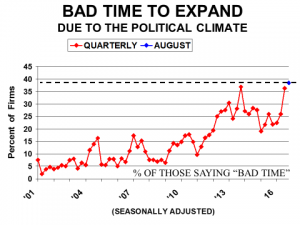 Except for weak sales and the economy, “political climate” is the second most frequently cited reason for not expanding a business and is at a record high level. Uncertainty about the economy and Uncertainty over government actions ranked fourth and sixth out of 75 problems that small business owners were asked to prioritize in an NFIB survey this year. The Fed laments the weakness in direct investment spending, but fails to understand that its policies have produced a major miss-allocation of funds and are one of the major sources of uncertainty that keep the Risk premium high, discouraging risk taking and investment.